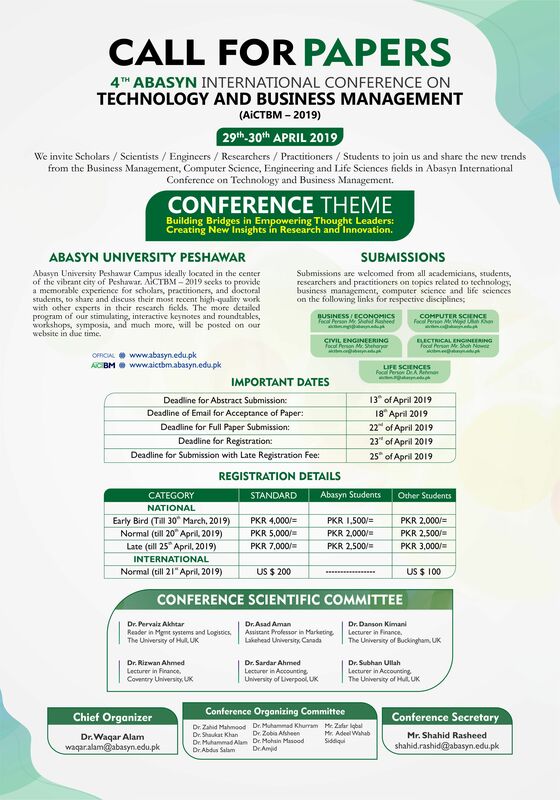 We invite Scholars / Scientists / Engineers / Reseachers / Practitioners / Students to join us and share the new trends from the Business Management, Computer Science, Engineering and Life Sciences fields in Abasyn International Conference on Technology and Business Management. Abasyn University Peshawar Campus ideally located in the center of the vibrant city of Peshawar. AiCTBM - 2019 seeks to provide a memorable experience for scholars, practitioners, and doctoral students, to share and discuss their most recent high-quality work with other experts in their research fields. The more detailed program of our stimulating, interactive keynotes and roundtables, workshops, symposia, and much more, will be posted on our website in due time. Submissions are welcomed from all academicians, students, researchers and practitioners on topics related to technology, business management, computer sciences and life sciences.